From wellness Woodlands eye exams, eyeglasses and contact lens evaluations, to eye emergencies and laser vision correction, our Woodlands optometrists provide comprehensive Woodlands eye care to patients of all ages, children to adults. We also treat a range of eye diseases and conditions such as glaucoma, the diabetic eye, dry eye and macular degeneration. With sensitivity to your vision needs, respecting your time and trying to keep you as comfortable as possible, our Woodlands eye doctors treat the whole patient, not just the eyes. At The Woodlands TSO, we provide eye exams for all ages. 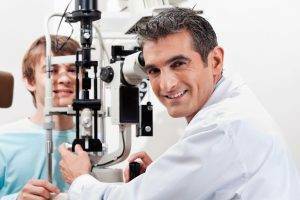 Learn more about our comprehensive eye exams. Did you know your optometrist can help you during an eye emergency? Read about which situations require emergency services. Texas State Optical can advise you and help you through the maze of Refractive eye surgery. Read more about the different options for eye surgery. Latisse treatment is available at TSO Woodlands. Find out how to get the thick, dark eyelashes you always wanted.